Here are resources to help you better understand issues in the Nicola Watershed and to keep you up to date on the current planning process. Here are Draft Terms of Reference for the new Nicola Steering Committee (NSC). Some of the following resources were prepared during the former Nicola Lake Planning Process. They have ongoing value for understanding issues in the watershed. Also see: Past Work: Nicola Lake Planning Process. Here are the workshop agenda and presentations. The Nicola Steering Committee commissioned Golder Associates to prepare a Lower Nicola Valley Groundwater Budget report, which was completed in March 2016. Eurasian watermilfoil (EWM) is of significant concern for Nicola Lake, and management of this aquatic plant is an important priority under the Nicola Lake Action Plan. Here are some helpful resources. 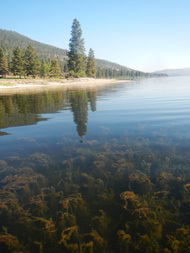 The Nicola Lake Eurasian Watermilfoil Management Plan is a product of the Nicola Lake planning process and an action item of the Nicola Lake Action Plan. Funding for the development of the NEWMP was provided by the Thompson-Nicola Regional District (TNRD). The purpose of the plan is to prioritize and manage EWM in high-use areas of Nicola Lake, reduce the risk of further introductions of EWM into other lakes in the region, and prevent the introduction of other aquatic invasive species into Nicola Lake. A report from Golder Associates in November 2013 found that European watermilfoil is common in almost all macrophyte — aquatic plant — communities in Nicola Lake. It was the dominant or subdominant species in 77% of the sites assessed in littoral areas of the lake in 2013. A 2014 report sets out findings and recommendations from an assessment by Triton Environmental Consultants on fish use of littoral areas that are considered of high value and in which EWM is the dominant macrophyte. The assessment was aimed at mitigating potential negative impacts of EWM control on fish and fish habitat.